My preferences are set to the lowest number of polyphony possible, and I only ever have one or two notes in a single channel/track sequence. Yet I'm still getting the error message above. 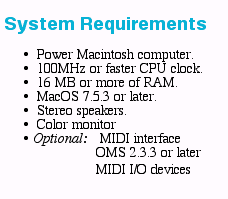 I meet and even exceed all of these requirements, except for one I'm not too certain about, which is the CPU clock speed. I read somewhere that the CPU clock speed is dependent on the host machine, so this shouldn't be a problem (if that's the case). 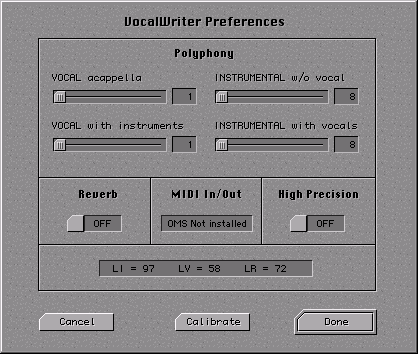 VocalWriter uses the (MacOS) system's built-in General MIDI synthesizer for its instruments, and the (MacOS) system's built-in speech synthesizer for vocals. I've noticed that when using the speech synth to "read aloud" text I've written in SimpleText, as well as previewing the synth in system settings, that it is very choppy as well. 'My Computer' icon on Mac desktop enabled. Built-in 68k DR emulator disabled. The ppc.log file is empty for some reason. Does anyone know what the problem is, and how to fix it?